Whiplash refers to any type of sudden movement of the neck that results in sprain or tear of muscles and tendons supporting the neck. 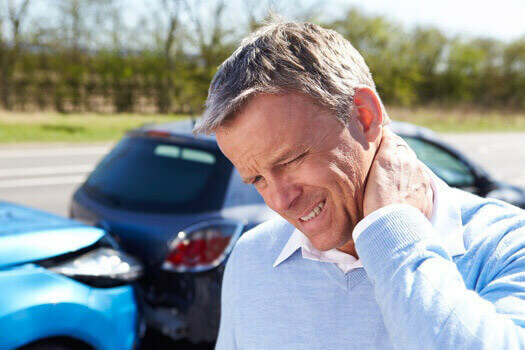 While commonly associated with car accidents, whiplash can also occur in athletes or individuals who fall in a way that directly impacts the neck. The application of ice or heat can reduce any inflammation or swelling of muscles and tendons in the neck from the impact, also reducing pain and discomfort. Ice or heat should be applied at regular intervals (usually every 30 minutes or so) for 2-3 days. Painkillers such as ibuprofen (Advil) and naproxen (Aleve) often help with pain and swelling. If OTC medications fail to relieve the pain or swelling, it’s best to see a doctor for further evaluation. Doctors may prescribe stronger painkillers when necessary. In some cases, doctors may recommend that a patient wear a neck brace to help keep the neck stable while muscles and tendons heal. Braces are meant to be worn only for a limited time since muscles in the neck may be weakened from prolonged wearing of a brace. Some patients with whiplash benefit from massage therapy. Since pressure has to be applied correctly to the neck to avoid further injury, patients are encouraged to work with a licensed physical/massage therapist. Pain is the most common symptom associated with whiplash. Additional symptoms typically include a decreased range of motion in the neck, tenderness in the neck area, pain that appears suddenly with normal neck movements and headaches. It’s best to seek medical attention with any injury to the neck, especially since symptoms of whiplash may not show up immediately. Whiplash treatment rarely requires neck surgery, however surgery is appropriate in severe cases where neck or shoulder pain is persistent. If you feel that the pain from whiplash may be enough to qualify for neck surgery, you may have a ruptured or herniated disc and could be a candidate for spine fusion, cervical artificial disc replacement or other surgical options. Reach out to The Spine Institute Center for Spinal Restoration at 310-828-7757 and schedule a complimentary, no-obligation consultation.